The Zebra ZXP Series 8 Duplex ID printer with Laminator is the perfect solution for high-volume, high-security I.D. card printing applications. The ZXP Series 8 laminator also offers the lowest total cost of card printing ownership with its patented, waste-free laminates and by providing increased card durability from daily wear and tear. The Zebra ZXP Duplex ID Printer uses a retransfer printing process, which produces higher image quality and allows true edge-to-edge printing - even on uneven surfaces such as smart cards. This also eliminates the white border left by even the best dye sublimation printers. 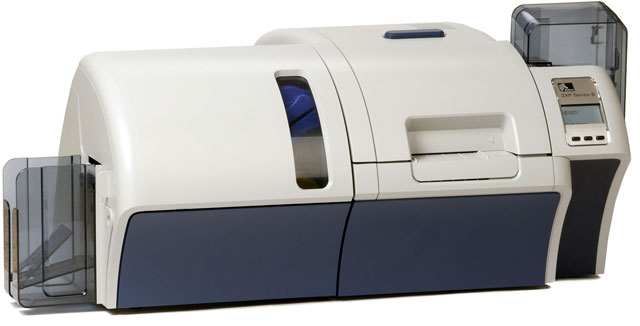 The ZXP Series 8 Duplex ID Printer offers amazing print speeds. Single sided throughput is 190 cards per hour (cph), and dual-sided printing is 170 cph. Zebra has developed an innovative approach to retransfer printing that allows both sides of a card to be printed simultaneously, resulting in these incredible throughput speeds. Additionally, the card feeding and retransfer process on the ZXP allow multiple cards to be moving through the machine at the same time. No more waiting for each card to finish before the next one moves through. The ZMotif XML-based software includes management tools and a modular design that gives you the flexibility to integrate with enterprise applications and add a variety encoding options as needed. The ZXP Series 8 Duplex can handle anything from employee badging to high-security government issued ID cards including smart card encoding. The engineers at Zebra redesigned the ZXP from the ground up, integrating years of manufacturing knowledge in this new platform. The ZXP Series 8 is designed inside and out to be reliable and durable - reducing downtime and increasing your ROI. The ZXP Series 8 has a two-year manufacturers warranty and a lifetime printhead warranty. Zebra ZXP Series 8 now features a factory-installed wireless connectivity option. The ZXP Series 8 WiFi supports 802.11b and 802.11g networks and a wide range of security standards and protocols, including Wired Equivalent Privacy (WEP) and advanced Wi-Fi protected access WPA/WPA2 standards. Wireless card printing allows you to print plastic cards on-site and on-demand withminimal IT infrastructure, saving you time and money. MIFARE/Contactless/Contact Encoding configurations also available.